From competitive alpha types, to first-timers looking to socialise and connect, there’s a seat for everyone in the sport of dragon boating. 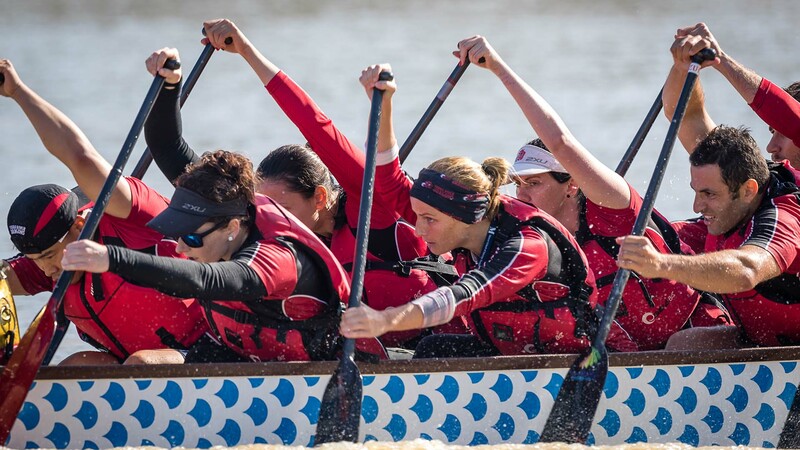 With a history spanning over 2,000 years, the waves of dragon boat racing reaches all continents as one of the fastest growing water sports in the world. The standard dragon boat consists of 20 paddlers (in pairs), a sweep (steerer) and a cox drummer. Small boats consist of 10 paddlers. Race lengths vary with 200m, 500m and 2km being the most commonly contested. Mixed (50/50 split of men & women) and Women, plus various age categories. The Australian national team is officially called the Auroras. There are over 120 clubs in Australia, so there’s most likely one near you! Interested? To give you an idea of what it’s all about, we chatted with a few of the clubs that make up the diverse dragon boat community in Australia. There’s no sign of slowing down for these senior wave makers. Tell us a little about your club. Dragon Masters was formed in 2006. We currently have close to 60 members. As a ‘Masters Team’ our target age group is 40 plus, with the largest number of members being over 60yrs old. We come from all walks of life – defence force, academia, business consultancies… It’s a diverse group. Definitely not. As a club, we’re very competitive. At the 2017 Australian Championships, we won 5 Gold Medals. We’re also proud of our 13 members who have, or currently are, representing the Australian team. That said, we do invite social paddling to promote healthy activity and participation in the sport. Do you go up against the younger crews? We’re one of the few masters’ teams in Victoria, so we often compete in the open-age category. We occasionally hear an opposition coach berating their crew for letting the old farts beat them. So we hold our own! Does the sport take you to some interesting places? We get to travel all around Australia, and the world. This year we competed at the Hong Kong International Dragon Boat Festival, and a few of us went to Malaysia as part of a combined team with another club. It’s a great way to see the world. So you get to have fun too? Yes we do. We’re very competitive on the water, but we often enjoy a social paddle up the Yarra, or cruising around Victoria Harbour. As well as the regular 1st of the Month pub dinner and other social events. What’s on the horizon for Dragon Masters in 2018? Based on this year’s success, we’ve been invited to compete at the Club Crew World Championships in Hungary. So we’re already training for that! Nice name! Tell us a little about Different Strokes. We started with just 10 paddlers back in 2008. The aim was to provide a social and fitness-focused sporting outlet for the LGBTQI community, as well as their family, friends and supporters. Almost ten years on, we’re now over one hundred strong. Though we’re primarily a gay and lesbian club, we welcome anyone who wants to join us regardless of culture, religion, age or sexual identity. It encourages team work, teaches responsibility for team mates & equipment, promotes leadership skills, builds resilience and is a positive environment where members are encouraged to reach their potential. In future years, we hope to set up a youth program. How has the dragon boat community taken Different Strokes? At first there was a bit of curiosity from other clubs, but we have always been made to feel welcome wherever we compete. There is a real sense of community and family throughout this sport. In fact, it was members from other Sydney-based clubs that helped us get up and running, and they’ve maintained their staunch support for our club through the years. What have been your club’s highlights since 2008? We won our first trophy in 2009, and in 2010 we were awarded Club of the Year by Dragon Boats NSW, our state’s governing body. We have members who have been selected as part of the Australian Auroras team. Our Masters Women crew have remained undefeated over 3 seasons at both local and Australian regattas. And recently, three of our crews qualified for the 2018 Club Crew World Championships in Hungary. The heart and soul of every dragon boat regatta. Dragons Abreast is more than just one club, right? Our Melbourne club (DAM Busters) was formed in 2001 and comprises breast cancer sufferers & supporters of various ages, abilities and interests. All up, there are 31 Dragons Abreast clubs around Australia. Which probably makes you the largest dragon boat club in Australia? And around the world, there are 197 breast cancer survivor clubs registered in 21 countries! So it’s quite unique in the world of dragon boating. We provide a “face” for breast cancer statistics; spreading awareness, empowering individuals, and educating on the benefits of an active lifestyle after diagnosis. Our philosophy is one of Awareness, Participation and Inclusiveness. We love getting out on the water once or twice per week, it’s so cathartic and good for your heart and soul. The friendships and memories made are life long and bring so much joy. As an international sport, we get to see the world as well. Not many sports allow you to paddle around the bays and canals of Venice! I was touched by a moving ceremony on the water by some of the Dragons Abreast clubs. Can you shed some light on this? The Flowers on the Water ceremony is how we show love and pay respect to members who have lost their battle with breast cancer, we call them our Angels Abreast. The ceremony consists of the DA teams rafting their boats together as we acknowledge the members we have lost to this insidious disease. We have a minutes silence and then play an appropriate song as everyone throws flower petals on the water. I’ve also seen a real competitive streak in many DA boats. There are many very competitive DA teams across Australia and we celebrate their successes. It’s such a fantastic achievement when you consider what these women and men have endured on their cancer journey. To go on and take part in a sport where fitness and endurance are paramount, is a huge achievement. What are the DAM Busters looking forward to this coming season? For us it’s the Dragons Abreast Australia Festival Regatta at Darling Harbour later in the year, but the big one is the upcoming international festival in Florence, Italy. We have a full boat heading there, and it will be amazing! The young upstarts destined for greatness. Looks like your club is as young as your members! We’re a young club, starting in 2011, but now we have with 76 members ranging from 17 to 65 years old. In that short time, you’ve achieved a fair bit of success. Last season was our most successful. At the nationals, we won gold in all mixed 20s boat categories. Our 20s Women won gold in 2km and bronze in 500m races. Our Open 10s boat won gold in 2km and silver for 500m and 200m races. And our ladies took out the 10s boat 200m race in Singapore, earning us $5,000 prize money. So you attract the more competitive types? Most people who join YRD are relatively sporty, so they’re used to competing, but the majority have never paddled before. We also have a lot of International expats or people new to Melbourne looking to try something new and make friends. You must train quite seriously and frequently then? Yep. We look to peak at various points through the year. For next season it will be December, end of Feb/March for state titles and Nationals. Then July for Club Crew World Championships. Training varies across the seasons with winter focused on longer distances to work on the technical foundation (and to stay warm). Closer to competition we focus on race strategies across each distance, or things like starts or surge finishes. Not much of a social life then? We don’t have time to be social, unless it’s at the gym. Just kidding! Our recent winery tour was fun. We also work in some fun stuff around club fundraising. We’re known to let loose at the post-race after parties, and we often give Different Strokes a run for their money when it comes to fancy-dress events! We love how the sport brings people together from different areas, backgrounds and ages. Interstate/International regattas gives us a chance to catch up with long-lost friends on other teams. It also provides a supportive environment to develop ourselves. Some of our paddlers weren’t always confident in sport; but suddenly, they have 20 team mates to work with towards a common goal. Many have learnt a lot about their personal limits, and how to push themselves, developing in leaps and bounds as athletes and as individuals. Ready to get dragon boating? Many clubs around Australia host open days, so visit Australian Dragon Boat Foundation and click under your state’s organisation to see a list of clubs in your area. What is body composition and why does it matter?